Qualcomm Datacenter Technologies, Inc., recently introduced the Qualcomm Centriq 2400, the world's first 10nm server processor. It features up to 48 cores of the Qualcomm Falkor's CPU, an ARMv8-compliant core highly optimized to deliver both high performance and power efficiency. 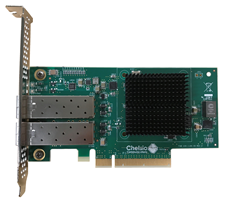 Chelsio Unified Wire's leading-edge performance for networking, storage, and data security applications combined with the Qualcomm Centriq 2400 processor based ARMv8 servers, enable a high performance, scale out, containerized, multi-tenant workloads in the datacenters. Qualcomm has also developed the QDF2400 Server, a Reference Evaluation Platform (REP) for customers and partners to experience, test, and validate Centriq 2400 CPU performance. The below Chelsio 10/25/40/50/100Gb Unified Wire adapters are listed on Qualcomm Approved Vendor List (AVL) as qualified solutions on the REP.